At GreenThumb Southend North our team consists of 3 staff, including 2 professionally qualified Lawn Advisors. We treat over 2,000 lawns each year, with each customer generally receiving at least four seasonal lawn treatments annually. The GreenThumb guys always turn up when they say they will. They do a good, neat job and tidy upon leaving. Our grass now has no weeds and is greatly improved since having treatment. Very reliable, friendly, efficient service and the lawn looks good too. I've had 3 weed and feed treatments and had lawn scarified today. It looks so much healthier. Excellent customer service friendly and professional. Thank you. I have used Nigel and his team since 2010. They do a professional and conscientious job. 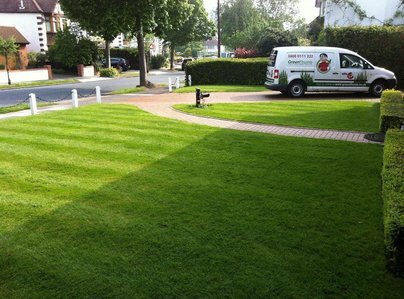 I have the enhanced treatment scheme I consider it good value for money when you take into account what you would spend on the various lawn products and the machine to apply it and the aeration and scarifying. I had a moss problem before I used them, now it is looking the best it ever was. I have received complements this summer on its appearance. This is a friendly and professional service which I highly recommend. Very professional, prompt, friendly, give good advice and my lawn looks great after this years treatment. Very good service. The lawn has markedly improved since treatment started. We have used Green Thumb for nearly 2 years. Nigel and his son have greatly improved our lawn, visitors also give appreciative comments. Nigel provides an excellent and professional service. I had used another company previously but the results were poor. Since using them my lawn has much improved, the grass is green and lush and we have practically no weeds. I recommend them without reservation. We have always found Nigel from GreenThumb, reliable, courteous and he knows his business.